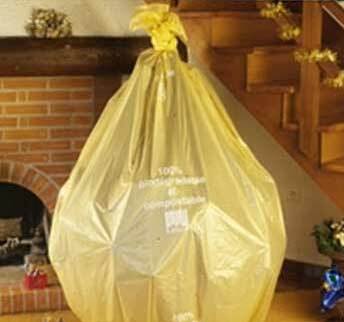 Christmas tree bags: A practical idea that can change your life! Why use a Christmas tree bag? It’s not a revolutionary idea but still the Christmas tree bag has been a great success. Thanks to it’s golden matte color, it will be in great harmony with your Christmas decoration. Put it openly at the foot of your Christmas tree and then start decorating the bag. Once Christmas is finished your just have to cover up your tree. For families living in apartments, you no longer have to deal with sowing thrones in stairways, lifts, hall entrances etc. The Christmas tree bag is nature friendly and biodegradable. You don’t have to worry about creating extra wastes. It will protect your floor from the humidity of your tree. Why ruin your beautiful parquets!